Can this man manage a Grapefruit League camp for baseball prospects? You bet! All's possible in Hollywood. Yesterday, also Good Friday for the Western Church and the start of Passover at sundown for all Jews, happened to be Opening Day for the New York Yankees—first pitch after 3 p.m. In a recent podcast, I predict Tampa Bay for first place and the Yankees for one of two Wild Cards in 2012. It is unlikely the Rays will go 162-0 or the Yankees 0-162. I’d have a better chance buying the winning Mega Millions ticket. To calm my nerves on this holy evening, I settled in to watch Big Leaguer (1953). 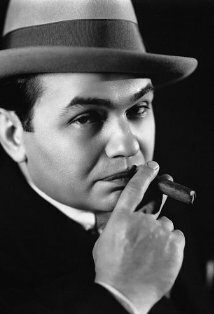 It stars Edward G. Robinson (to keep to the holiday season, the Yiddish-theater-trained actor who played Dathan in The Ten Commandments) as the manager of a New York (before the move to San Francisco) Giants spring-training tryout camp in Florida. In Right Off the Bat, Martin and I survey some of the outstanding baseball and cricket films. Not to make too many excuses (cough cough), it is tough (of course!) to include everything in those few pages allotted. We leave “out” Eight Men Out from John Sayles, and others possibly even more worthy in our readers’ eyes. The E. G. Robinson picture includes every baseball nugget imaginable: actors meant to be eighteen but looking to be closer to thirty-five, as well as the Old Pro Stuffed Shirt (Robinson) no longer wanted by management in those early rock-and-roll, cold war days before age-discrimination legislation—though he is still much loved and needed by his baseball-groupie niece. It all turns out OK. The son of a stern-European-hates-baseball type winds up a top prospect under minor-league contract, with a proud-as-punch dad; the son of a gloating father (I think a former ballplayer himself) doesn’t make it, as his father sadly but in sportsmanlike fashion agrees; and the cocky pitcher cut by Robinson (whom EGR believes at the time might be “the one that got away”) catches a break with the rival Brooklyn Dodgers. Girl (groupie, more-or-less Anne Francis-like dancer and period-actress Vera-Ellen) also gets boy. Carl Hubbell has a significant role as does the lesser-recognized Al Campanis. This entry was posted in Baseball, Cricket, Right Off the Bat Book, Right Off the Bat Podcasts, Yankees and tagged Al Campanis, Brooklyn Dodgers, Carl Hubbell, Joe Girardi, Major League Baseball, Mariano Rivera, Mark McGwire, New York Giants, Nick Swisher, San Francisco Giants, Wild Card, Yankee Stadium. Bookmark the permalink.